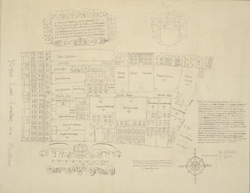 This is a copy of a plan made by Goslyng in the 17th century of the buildings upon the land owned by Sir Nicolas Bacon, Knight of the Bath. The names of the tenants to whom the land was first granted are recorded in each case. The buildings erected on the land are shown in elevation. The plan features a compass rose, a coat of arms and a decorative scale bar.